The standard kit (for the 2300, 2300D, 2300DN) includes a PrinterTechs compatible fuser, a transfer roller, and pickup rollers and separation pads for the cassette tray and manual feed tray. The extended kit (for the 2300TN or 2300DTN) includes an extra separation pad and pickup roller for those customers with a double-cassette printer. You can save money by purchasing the fuser on exchange. See exchange terms further below. HP LaserJet 2300 series maintenance kit with fuser exchange. 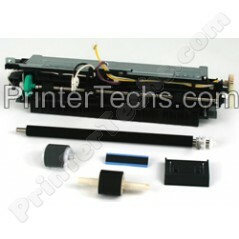 HP LaserJet 2300 series maintenance kit WITHOUT fuser exchange. HP LaserJet 2300TN series maintenance kit with fuser exchange. The standard kit (for the 2300, 2300L, 2300D, 2300DN) includes a fuser, transfer roller, and pickup rollers and separation pads for the cassette tray and for the manual feed tray. The extended kit (for the 2300TN or 2300DTN) includes an extra separation pad and pickup roller for those customers with a double-cassette printer.